We introduced the SGP system on November 2, 2007. It’s meant to be a quick and very easy way of ‘reading’ a whisky’s aromatic profile, and was inspired by Diaego’s new Single Malt Flavour Map. Of course any dedicated whisky freak will notice that we grouped aromas and flavours that shouldn't really be in the same clusters (such as peat and meat, or porridge and grass) and immediately feel the need to subdivide these three simplistic scales into dozens of subscales but I thought it was better to have a simple system that works rather than a huge labyrinthine system that we’ll never manage to handle properly since what we always lack is time (no, not whisky). 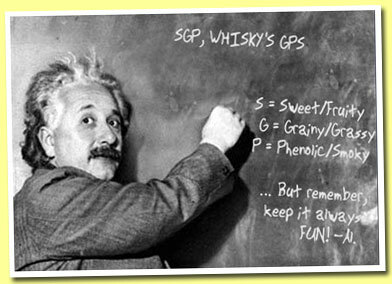 With this SGP system, plain water would get an SGP of 000 whilst a careful vatting of young cask strength Ardbeg, Macallan and, say Clynelish would possibly get an SGP of 999. Glenwhatever 10 yo 1997/2007 (46%, OB, cask #1234, 456 bottles) Colour: blah, blah, blah. Nose: blah, blah, blah. Mouth: blah, blah, blah. Finish: blah, blah, blah. SGP:123 - 90 points. Benriach 22 yo 1984/2007 (53.2%, The Single Malts of Scotland) Blah, blah, blah. SGP:438 – 91 points. Benriach 30 yo 1976/2006 (53%, OB for LMDW, cask #3557, 222 bottles) Blah, blah, blah. SGP:932 – 92 points. The first figure (S) clearly indicates that the 1976 is extremely fruity (S=9). Both are mildly grainy/grassy (G=3) whilst the 1984 is very phenolic/smoky (P=8) and the 1976 displays just hints of such notes (P=2). A quick glance at both SGP's should clearly indicate to any of our distinguished readers how different these two malts are, even if they both come from the very same distillery.